1. Numerous solo and chamber music appearances internationally as well as in the U. S. A. 2.Recordings with Ciompi Quartet on Sheffield Lab and Albany labels. A music composition " Sound. Distant" for violin and guzheng by Mark Kuss was premiered on my annual recital in fall of 2009 at Duke that was original created as a music response to Nasher Museum's exhibition entitled: "Displacement: Three Gorges Dam and Contemporary Chinese Art", has now developed into a collaboration on an extended work, a concerto in three movements for violin, guzheng and an orchestra. This project will have a great impact in the music world and as it is a first work ever written for violin and guzheng assisted by a western orchestra --a combination that has apparently no active history. Orchestra New England (ONE) in New Haven, Connecticut has invited composer Mark Kuss to write a three movements work featuring Jennifer Chang and me as the soloists and this new work will be premiered on May 7, 2011 as part of ONE's 2010-11 subscription series. 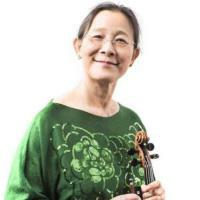 An additional collaboration with Duke Chamber Players, a student-run chamber music orchestra during DCP’s 2010-11 season will be held at Von der Heyden, Perkins Library in April 2011.
with “Music for violin and Piano” volume 2, by the Chinese composer Ma Sicong. Naxos 8.570605 Naxos, March, 2010 . Hsiao-mei Ku and Ning Lu. "Music for Violin and Piano" Vol.II by Ma Sicong. ClassicsOnline, November, 2009 . Hsiao-mei Ku and Ning Lu. Violin and Piano Music of Ma Sicong (I). Naxos, July, 2007 .
judge (juror) for the string area of the preliminary round of The Rosen-Schaffel Young Artist Competition in 2011 and 2012.